Robert Owens, Steven Riley, Lima NAACP President Ron Fails, Denise Cobbs, Les Henderson Sr. and Pastor Arsben Jennings participate in the Lima NAACP press conference to address support of Issue 1 Tuesday at Grace Church Worldwide Ministries on 2945 Wells Drive. LIMA — Issue 1 will not only provide better treatment to individuals who struggle with substance and drug abuse, but it will also cut prison costs and will help revitalize civil rights, according to Lima NAACP President Ron Fails. On Tuesday, Fails held a press conference to publicly announce the Lima National Association for the Advancement of Colored People’s support of Issue 1 at the Grace Church Worldwide Ministries. He also expressed that the Ohio Legislative Black Caucus, Ohio chapters of the NAACP and Gary Mohr, the former director of the Ohio Department of Rehabilitation and Correction, were in support of the amendment as well. “Issue 1 will better deal with the issue of overcrowding in state prisons and the cost of incarcerating a person in state prisons,” Fails said. Ohio Issue 1 could reduce by up to 25 percent an incarcerated individual’s sentence if they participate in rehabilitative programming, and criminal offenses of select drugs and controlled substances could be classified as a misdemeanor. It could also prohibit jail time for possession of or use of select drugs, and available funding would be applied towards state rehabilitation programs and crime victim funds. Fails believes Issue 1 would be be a better way of addressing drug addiction because it is considered a disease. Despite the support the Ohio Legislative Black Caucus, The Lima and Ohio NAACP and Mohr, several officials in the Lima area have voiced their opposition of the proposed amendment. Allen County Common Pleas Court Judge Dave Cheney believes that the amendment could cause drug offenders to not complete their court-ordered treatment or not seek treatment at all. Fails understands that State Issue 1 is not perfect, but will help those who need treatment so that they can be productive citizens in the community. 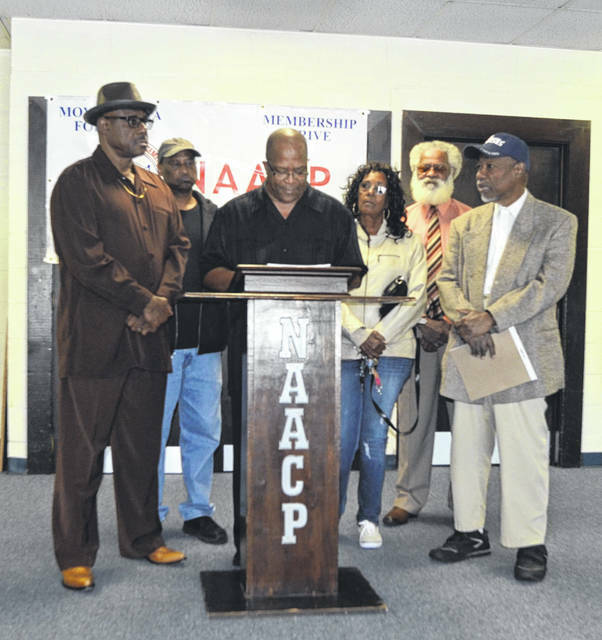 https://www.limaohio.com/wp-content/uploads/sites/54/2018/10/web1_NAACP-Issue-2.jpgRobert Owens, Steven Riley, Lima NAACP President Ron Fails, Denise Cobbs, Les Henderson Sr. and Pastor Arsben Jennings participate in the Lima NAACP press conference to address support of Issue 1 Tuesday at Grace Church Worldwide Ministries on 2945 Wells Drive.